At Backhouse Media, we take server security very seriously. Our Support Team is always trying to balance tight security with client usability. The Firewall helps block unwanted traffic from our servers, including but not limited to: login hacking; DDoS attacks and malware/virus installation. Each day, our servers block thousands of hits from malicious people. On occasion, the Firewall accidentally blocks our legitimate users because they exhibit behavior consistent with malicious traffic. When your IP address is blocked, it effects everything in your home or office using that password, including computers, phones and tablets that are using the same router or network hub. This block is not per device, but effects your entire IP address. My website appears to be down on all devices on the same network. When you remove your phone or tablet from the WiFi and use your cellular service, the website appears again. Your device or maill app is unable to check for or send email. What can get me blocked? The most common case we see is users guessing an incorrect password too many times on either their email or cPanel account. If you type in the incorrect password too many times within a short time period, the Firewall assumes you’re a hacker trying to randomly guess passwords. As a result, you get temporarily blocked. If you get temporarily blocked too many times within a 24-hour period, your IP address is permanently blocked. A permanent block requires either intervention by our Support Team or now you can manually unblock yourself via your Billing account. REMEMBER: When you change your email password, you must immediately update all of your devices that automatically check for email, including phones, tablets, mail apps. If you don’t those devices and apps will ping the Firewall with your old (incorrect) password every few minutes, inadvertently blocking you from the server. 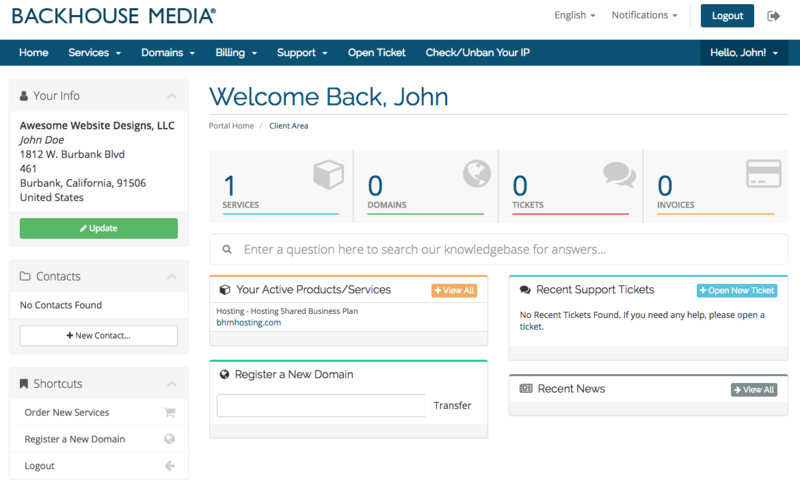 Log into your billing account at: https://billing.backhousemedia.com. Your username is the email address on file with us which is normally the email where you receive Invoices and Payment Confirmations. Once you log in, you’ll be at the Dashboard. In the menu, you’ll notice a link to Check/Unban Your IP. Click there to enter the Unban Center. Once in the Unban Center, your current IP address is already filled in. You are only able to view the status and unban the IP you’re currently on. This is to prevent other accounts from unblocking legitimate threats. 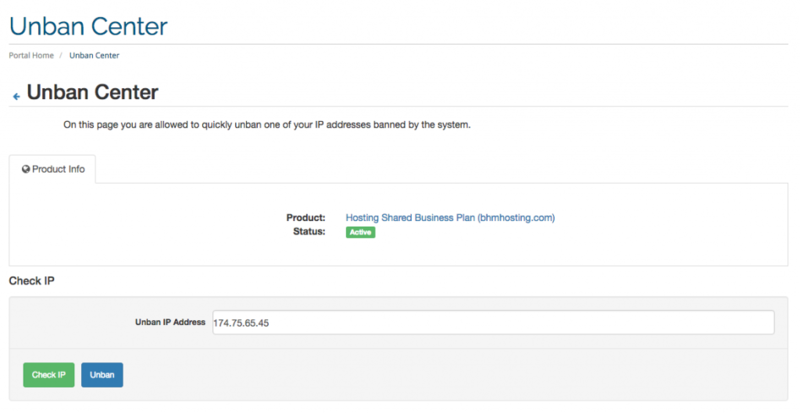 If your IP address is blocked, simply click on Unban to restore service to your IP address. If you’re attempting to unblock from a phone or tablet, make sure that your device is on the WiFi network that’s blocked. If you’re not, you’ll be scanning your cellular IP address which is most likely not blocked. 3. What can get me blocked?